Quick Post: This meal was a hit at my house – even my picky daughter ate it up 🙂 Enjoy! The night before, season chicken breasts with salt and pepper. Whisk together 3 tablespoons olive oil, basil, parsley, garlic and 3 tablespoons of wine in a bowl. Place chicken in a large ziplock bag, then pour marinade over top and coat chicken. Keep in the fridge overnight. The next morning, place chicken in your crockpot with 3 tablespoons of wine. Cook on low for 6-8 hours. Once cooked, combine with remaining olive oil, parmesan and salt and pepper if desired. 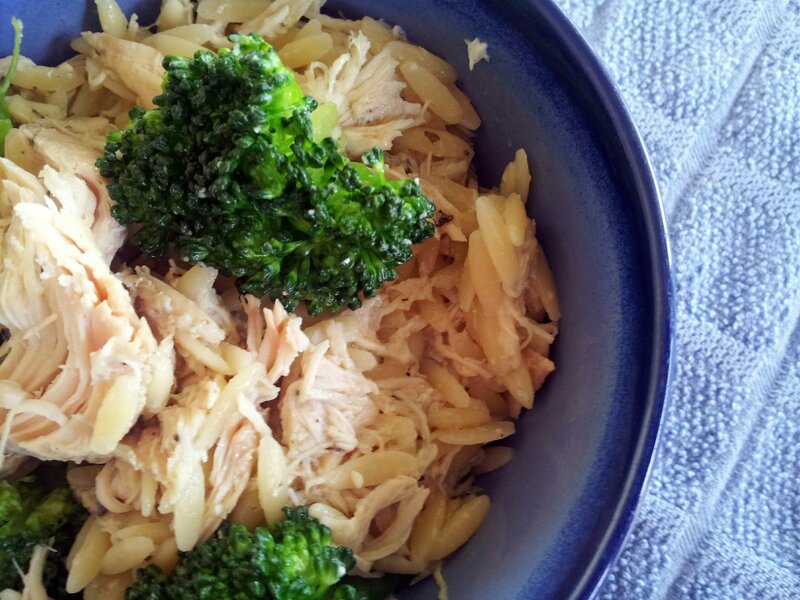 Cut chicken into pieces/chunks, and toss together with orzo. Add stock to a medium pan and bring to a boil. Add the orzo, cover pot and reduce heat to simmer. Cook for 15 minutes, stirring occasionally, or until liquid is absorbed and pasta tender. Watch the pasta during the last few minutes, if too much liquid has evaporated, you can add a few tablespoons more of broth. When pasta is done remove the lid and stir in the cheese. Season with salt and pepper, to taste. I love Orzo, especially when it’s cooked with tomato sauce and served with lamb. But I can’t wait to try it with chicken now! Thanks!